I got no problem putting bullet points in a box! I love good boxed texts, both as a DM and a designer. In my experience, there are two main problems with boxed texts – they’re too long and/or the DM reads them monotonously. The first problem is on the designer. In my scenarios I try keep them limited to 3 sentences which means I have to make sure they’re impactful, tight, and evocative. If they’re not these things why is it boxed text? The second problem is training and experience. Not everyone is good at reading aloud to a group, and sometimes a DM doesn’t even know they’re bad at it! But it’s a skill like everything else. Read it aloud ahead of time if you can, look at the grammar clues to help phrase it, try to vary the pitch of your voice to match natural crescendos and decrescendos, and look up occasionally from the text to make eye contact. Those are my handful of coppers! Thanks! The example you post from the Cellar of Death is a good example of different uses for boxed text based on the context of the scenario. Anytime I see a paragraph break in a boxed text I cringe but sometimes, especially (or perhaps only) for introductions, it can be useful to set a scene. But as a designer I think it’s worthwhile to pay attention to the points where the players can engage with the story. Callbrax speaks to the PCs in the first paragraph, so they should be allowed a chance to respond. The rest of the boxed doesn’t offer much useful information for the players (there’s a cliff and Callbrax makes a door appear using magic). I’m not sure what Remalia’s horn is? Or why it would bleat? So I have to assume that in context of the rest of the adventure text that makes sense. If that’s an important sound for the players to hear and recognize I would try to call it out in the text rather than couch it in the boxed text. I hope this doesn’t come across as too negative! I honestly love your adventures and designs, but I wanted to offer some details of how I as a DM prefer to use boxed text and your example was right there 🙂 Thanks! I keep thinking of more to add 🙂 I also think it’s worth noting that writing for reading aloud is different than writing for internal processing. 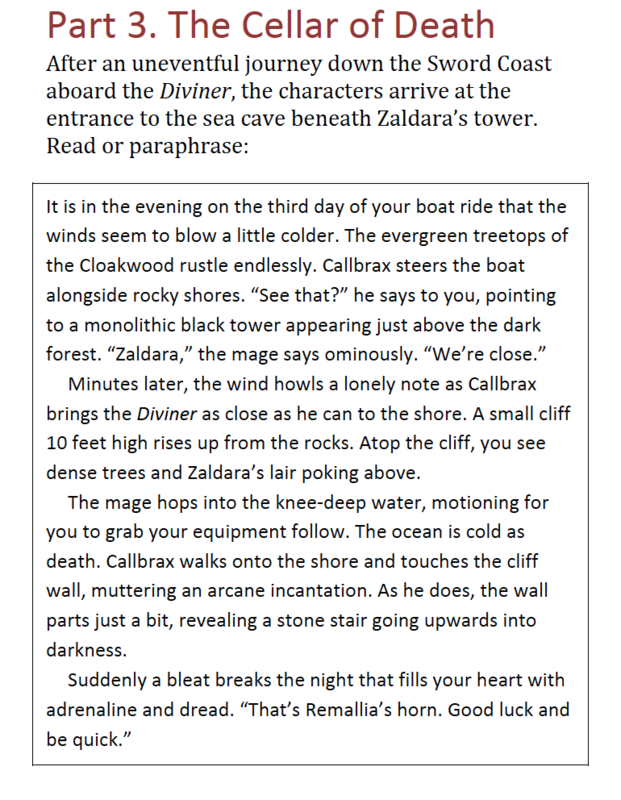 In the Cellar of Death example, Zaldara’s tower is referenced as a monolithic black tower in the first paragraph. Perfect and evocative! Later, it’s referred to as Zaldara’s lair. I think there’s nothing wrong with using tower in the second reference to reinforce what it is to the players. Keeping that in mind when designing boxed text can help DMs convey critical points to the players especially in longer boxed texts. Hey thanks for all these opinions! No offense at all taken. I used my own text because I’d rather that be analyzed then someone else who didn’t ask to be part of the conversation. Keeping boxed text short, concise, and consistent definitely helps. I also think we can do even better than that to service players and keep it collaborative. Breaking it up as you suggest is another good way to do that. This is a cool way to do it. Reminds me of aspects in FATE. I like boxed text if it tells a story. Like a CCC I;’m working on, it describes different NPCs interacting and then interacting with the PCs, leading to a skill challenge. The boxed text sets up the intro to the “just in the door” skill challenge. However, I don’t like the ones that are pure narrative for the sake of narrative. I struggled with Season 8’s no-read-aloud style but am coming around to seeing it lets the DM narrate as they naturally would and doesn’t put the adventure on a cut-scene mode like in a video game. I am going to sound like a monster, I know, but almost every problem you mentioned with boxed text sounds more like a lack of preparation issue than a design issue. As a DM, it is your job to know the world you are running. I don’t think you sound like a monster. This has come up in some other response on social media. I disagree. I think being unprepared makes worse problems with boxed text that already exist. Most people use modules because they are short on time (or in an organized play program where adventures are sometimes run by DMs who JUST got asked). 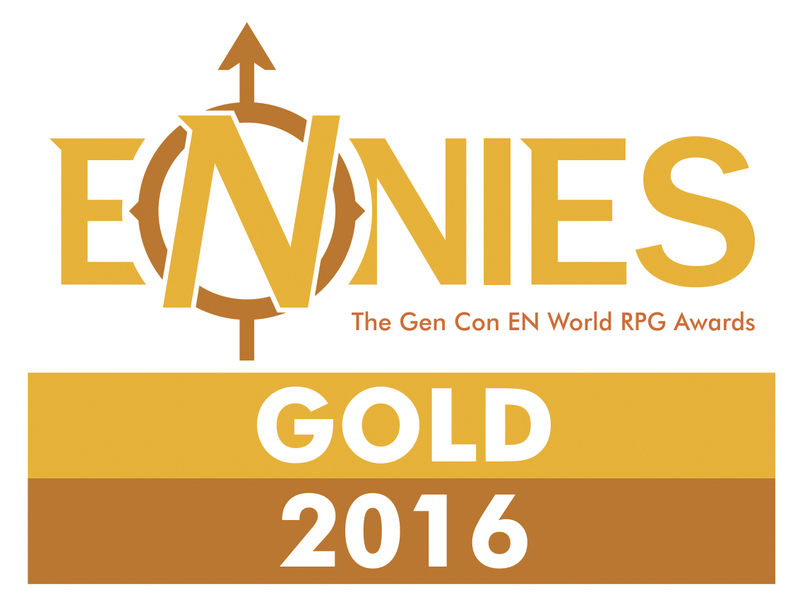 I think it’s the job of game designers to write adventures that can be read once then run. If a GM wants to prep more, that’s their choice (and a good one for many people), but one of the great selling points of modules is a GM does not need to do as much prep. Boxed text is supposed to help with that, and in some ways it does, but I think we can create descriptive text that works even better. As new DM of 2 years, I really like that bullet point option. When I’ve run published adventures, I’ve tended to re-write the boxed text in my notes as bullet points in my own voice anyway. This would save me a whole step of my prep! Hey thanks! I’m glad to hear you like it. I love the bullet approach! I think the problem with box text is a break in voice. Even if it’s really well-written, it’s not going to sound like it’s coming from the DM, so that’s going to break the immersion relatively quickly. I really like the idea of the italics and parentheses so it’s easy for the DM to see just by glancing everything that’s going on. And maybe other people don’t struggle with this, but sometimes I feel really nervous (or excited) DMing, and so I can miss or forget things, even in what I’ve written for myself. In someone else’s adventure, hitting that boxed text is like reaching a milestone; the DM gets to take a break for a moment and can read instead of invent. And maybe that brief mental rest instance on the DM’s part creates that zoning out for the players? The points you’re making about collaboration are crucial too! Does boxed text make players feel invited to the world building and in-game moment? I think you’re correct to suggest that it maybe doesn’t. Thank you for putting this together! I’m absolutely going to try out bullet points for my next DMsGuild adventure! Thanks, Beth!!!! That’s exactly what I was going for.